Polonaise is a widespread dance in carnival parties. Polonaise is always a first dance at a studniówka ("hundred-days"), the Polish equivalent of the senior prom that occurs approximately 100 days before exams. Frédéric Chopin's polonaises are generally the best known of all polonaises in classical music. Other composers who wrote polonaises or pieces in polonaise rhythm include Johann Sebastian Bach, Georg Philipp Telemann, Wilhelm Friedemann Bach, Carl Philipp Emanuel Bach, Wolfgang Amadeus Mozart, Ludwig van Beethoven, Michał Kleofas Ogiński, Niccolò Paganini, Maria Agata Szymanowska, Franz Schubert, Vincenzo Bellini, Louis Spohr, Carl Maria von Weber, Robert Schumann, Franz Liszt, Henryk Wieniawski, David Popper, Johann Kaspar Mertz, Moritz Moszkowski, Friedrich Baumfelder, Ferdinando Carulli, Mauro Giuliani, Modest Mussorgsky, Pyotr Ilyich Tchaikovsky and Alexander Scriabin. Polonaise is a Polish dance and is one of the five historic national dances of Poland. The others are the Mazurka (Mazur), Kujawiak, Krakowiak and Oberek, last three being old folk dances. 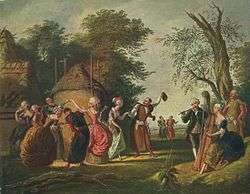 Polonaise originated as a peasant dance known under various names – chodzony ("pacer"), chmielowy ("hops"), pieszy ("walker") or wielki ("great"), recorded as early as the 15th century. In later centuries it gained popularity among the nobility and townspeople. ↑ Blatter, Alfred (2007). Revisiting music theory: a guide to the practice, p.28. ISBN 0-415-97440-2. ↑ Don Michael Randel. The Harvard Dictionary of Music. Harvard University Press. 2003. p. 668. ↑ Roderyk Lange. Tradycyjny taniec ludowy w Polsce i jego przeobrażenia w czasie i przestrzeni. PUNO. 1978. p. 40. ↑ Selma Jeanne Cohen. International encyclopedia of dance: a project of Dance Perspectives Foundation, Inc. Oxford University Press. 1998. p. 223.